One of the goals for our garden is to meet our defined needs of fresh, nutritious, organic produced food, for canning, pickling, freezing, and winter storage. We also wanted to meet our food likes and prepare meals from the fresh foods and stored foods from the garden. Hence the concept of Menu Planting. We like beet greens, so we plant beets just for the greens two to three times through the season. We love Hodge Podge so we plant green and yellow bush beans, peas, and an early potato. We are very fond of a Grilled Caesar Salad. so we plant Romaine Lettuce. We like eating roasted vegetables, grilled vegetables, love Italian food, enjoy stir fry and of course need salsa. Menu planting is simply planting for the meals you enjoy. You can menu plant easily in any garden. A common method is to use a raised bed for specific needs, such as a salad garden, salsa garden, Italian garden, etc. We will have some special beds, but for the most part, our menu planting is throughout the garden. Salsa Garden – Some vegetables to include in the salsa garden are tomatoes, tomatillos (need two plants for cross pollination), bell peppers, chile peppers, onions, garlic, and cilantro. Your personal taste will determine choices of peppers from mild through super hot varieties. Use colour, such as red onion, different colour tomatoes and peppers. Remember, if you want garlic, it is planted in the fall. 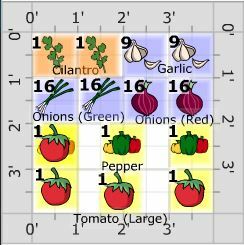 Here is a sample salsa garden produced with the Garden Planner. Mix well, place in the refrigerator a few hours before serving. Enjoy in your garden! 2. 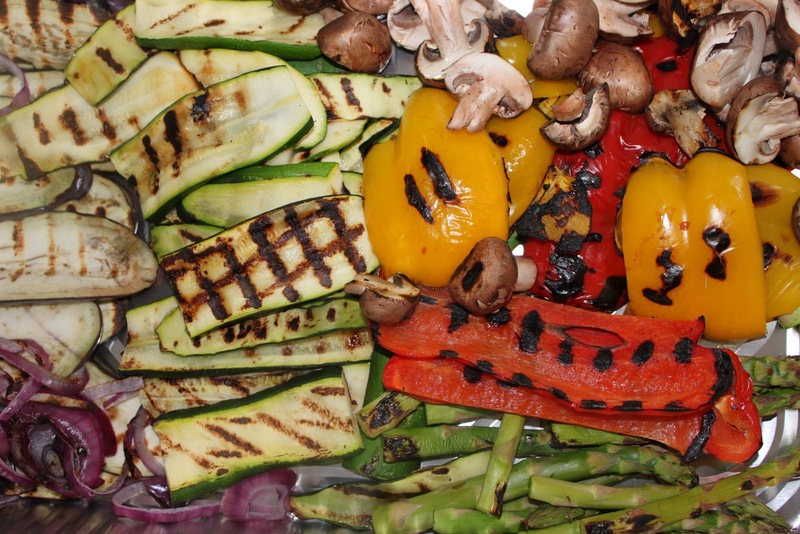 Grilled vegetables – Grilled veggies accompany pretty well all our BQ meals. Our favourites include asparagus, green beans, carrots, corn, egg plant, onions, peppers, potatoes, sweet potatoes, squash, green tomatoes, zucchini and Romaine. Keep it simple, slice veggies to size, toss in olive oil, add salt and pepper and place on the heated grill. Grill time varies. General rule is the harder the vegetable, the more time on the grill. Check for tenderness and nice grill marks, garnish with chopped basil, oregano, or rosemary and chow down. Here is a grilled salad that we enjoy. 1. Preheat grill to high. 2. In a blender, combine the garlic, lemon juice and Dijon mustard. Drizzle in 3/4 cup olive oil to emulsify. Add the Parmesan and pulse. 3. Cut ends off bread and save for another use. Cut bread into 16 slices and lightly brush both sides with Caesar dressing. 4. Grill bread for approx. 10 sec. per side or just long enough to toast and pick up grill marks. Remove from grill. 6. Cut romaine in half length wise, drizzle romaine in olive oil and season with salt and pepper. Grill for 2 minutes, until grill marks appear and the romaine becomes wilted. 7. On each of eight salad plates, arrange Romaine lettuce halves, pancetta, ciabatta toasts. 8. Drizzle with dressing, add pancetta, garnish with shaved Parmesan and serve. 3. The Italian Menu – Vegetables needed for our love of Italian food include tomatoes, peppers, onions, garlic, greens, beans, squash, zucchini, asparagus, Required herbs are basil, oregano, rosemary, parsley. Besides enjoying fresh ingredients in our Italian eating, we can tomatoes, tomato sauce, roasted peppers, and beans. We also dry herbs and garlic for use through the winter. If you are gardening with children, help them create a pizza garden and of course, make a pizza from the bounty of their garden. Here is a link to a sample Pizza Garden. Plant and grow what your family likes to eat and plan your menus around the food you grow. Herb garden, stir fry garden, pickling garden?